Halibut with two sauces, an heirloom tomato reduction and an herb infused vinaigrette. 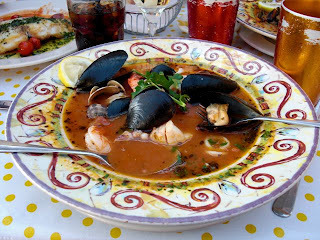 And Cioppino - prawns, mussels, clams, and calamari in a spicy tomato and white wine broth! Yep - I copied that straight from the online menu!! 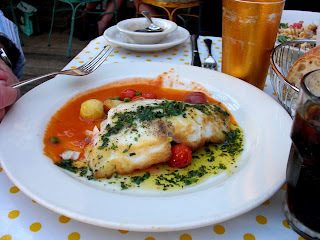 The halibut looks fabulous....I assume white wine with these dishes?? The Cioppino was really good with lots of fresh seafood. You ordered two things I KNOW that you cook well! Adam and I never order salmon out because I can cook it better than anyone else. Maybe I should be a little more adventurous, or not so much a food snob! Yeah, but sometimes it's nice to let someone else do the work! !